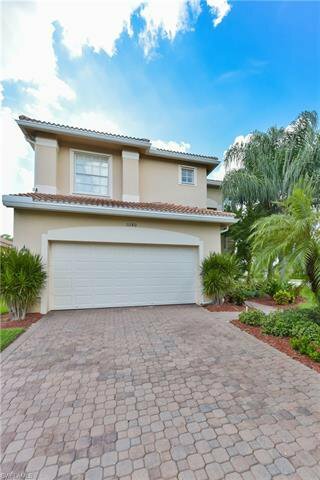 This professionally decorated, Poinciana Model has been recently updated and designed by an award winning design Firm. Offering a spacious, open 2-Story floor plan with 4 bedrooms, 3 full baths, 2-car garage and an oversized loft. This beautifully designed home features many upgrades, such as; Brazilian-cherry wood flooring throughout great room and formal dining room, Stainmaster® carpet in all bedrooms/loft and a gourmet kitchen with granite countertops, stainless steel appliances and saturnia marble flooring. Flooded with natural light, the great room features a custom home theater entertainment center with large HDTV and unique stone accent wall. Other architectural details include accent molding and mirrored walls in formal dining room and foyer. Situated on a large corner lot with ample back yard space, this prime location is only walking distance from the clubhouse. Listing courtesy of Keller Williams Realty Naples. Selling Office: Equity Realty.